Welcome to a guided tour of Aviation Photo Gallery! I have created this tour to show how my website was put together. I will explain some of the techniques I have used, such as programming languages, software packages and online resources. Along the way, I'll also be having a look at my other websites: Scottish Mountain Landscapes, Picture Postcards Online, and Aviation Photo Gallery Blog. The tour takes up several pages, and you can use the drop-down menu at the top of each page to navigate. The tour includes some links to other pages within my own websites, and these links will open in a new tab on your browser. There are also links to other external websites, which work in the same way. Please note that I am not responsible for the content of external websites. 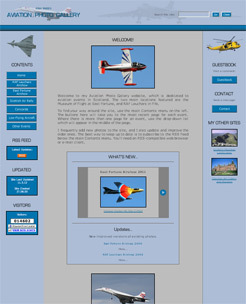 The basic mark-up language for Aviation Photo Gallery is HTML 4.01 Transitional. 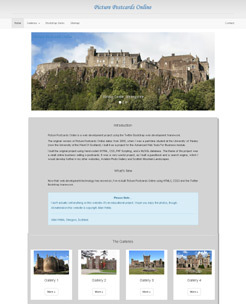 For Picture Postcards Online, it is HTML 5. 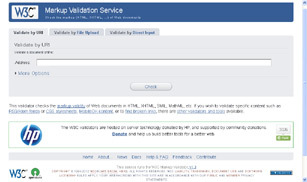 All the mark-up is validated using the W3C Markup Validation Service. This is a very useful online resource provided by the World Wide Web Consortium (W3C), which is an international community where member organizations, a full-time staff, and the public work together to develop Web standards. I have used properly validated mark-up to achieve consistency of layout and functionality for my web pages in as many browsers as possible. Well-structured markup also makes updating the site much easier- more of which later. I also use W3C's other useful online resources: CSS Validation Service, and Feed Validation Service. The majority of the code is my own work, and was written completely from scratch. Where I have used code from other sources, such as on-line tutorials, I have extensively customised it to work seamlessly with my own code. Nothing was just "copied and pasted". 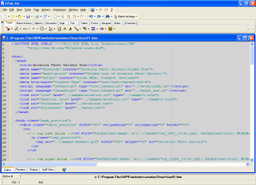 I use the cmBatchReplace Plugin with HTML-Kit 292, which provides a multi-file search and replace facility. With over 1000 individual pages on the two sites, updating each page manually would take forever, and cmBatchReplace is a great way to save time. cmBatchReplace also supports regular expressions, which can be used to select and replace specific strings of text across multiple files. This is where it really pays to have well-structured validated code, and a consistent layout on each page. In the next section of the tour, I will look at Scripting and Databases. © Copyright 2019 Aviation Photo Gallery.